Santiago Ramón y Cajal (May 1, 1852 – October 17, 1934) was a Spanish histologist (study of tissues) and physician who (along with Camillo Golgi) won the Nobel Prize in Physiology or Medicine in 1906 for establishing the neuron (or nerve cell) as the primary structural and functional unit of the nervous system. Ramón y Cajal provided definitive evidence that neurons are discrete cells that communicate with each other via specialized junctions, or spaces, between cells. His discovery became the basis for what is today known as the neuron doctrine, one of the central tenets of modern neuroscience. To observe the structure of individual neurons, Ramón y Cajal used a silver staining method developed by Italian anatomist Camillo Golgi, who supported the prevailing view of the time that the nervous system was a connected meshwork rather than a system made up of separate cells. Convinced that the brain needed independent neurons to function as a dynamic system that was capable of learning and growth, Ramón y Cajal persisted, modifying Golgi's technique until he obtained clear pictures of distinctly bounded nerve endings. Although he became one of the founders of neuroscience, as a young man Ramón y Cajal wanted to be an artist, and vision would play a central role in his scientific contributions. Ramón y Cajal felt the most essential quality of a scientist was the ability to see clearly; according to Cajal, Golgi was actually seeing separate cells when he looked at the stains, but believed he was seeing a net because he fell prey to suggestion (Otis 2001). Thus, Ramón y Cajal joined the list of individuals in history who brought a fresh perspective to issues, confronting erroneous paradigms. Ramón y Cajal’s artistic leanings extended to the writing of fiction: one year before receiving the Nobel Prize, he published a science fiction collection called Vacation Stories (Cuentos de vacaciones) under the pen name “Dr. Bacteria.” These five stories, which tackle ethics in science and challenge established views on organized religion and social class, reveal their author to be a scientist who was deeply engaged with the larger social and ethical questions of scientific discovery. Ramón y Cajal’s beautiful and meticulously rendered drawings of neurons are still used in textbooks today. The son of Justo Ramón and Antonia Cajal, Ramón y Cajal was born of Aragonese parents in Petilla de Aragón, a poor, rural enclave in northeastern Spain. As a child he was transferred between many different schools due to his unruly behavior and anti-authoritarian attitude. An extreme example of his precociousness and rebelliousness is his imprisonment at the age of eleven for destroying the town gate with a homemade cannon. He was an avid painter, artist, and gymnast, who preferred being out of doors rather than trapped in school memorizing lessons. However, Justo Ramón, who himself had escaped poverty by becoming first a surgeon and later a physician, was determined to make his son a doctor. Ramón y Cajal attended the medical school of Zaragoza, from which he graduated in 1873. Drafted into the Spanish army, he became a military doctor, with the rank of captain, and was sent first to the Carlist campaign and later to Cuba (where a nationalist uprising demanded independence from Spain). Ramón y Cajal returned to Spain in 1875, after nearly dying from malaria contracted while in Cuba. In 1879, he married Silveria Fañanás García, with whom he had seven children (two of whom died in childhood). Ramón y Cajal secured a post as an assistant professor at Zaragoza teaching anatomy in 1879, and was appointed university professor at the more prestigious Universitat de València in 1881. In 1883, he was made chair of the anatomy department there. He later held professorships in both Barcelona and Madrid, remaining in the latter position for 30 years. He was Director of the Zaragoza Museum (1879), Director of the National Institute of Hygiene (1899), and founder of the Laboratorio de Investigaciones Biológicas (1922) (later renamed to the Instituto Cajal, or Cajal Institute). Ramón y Cajal died in Madrid in 1934. 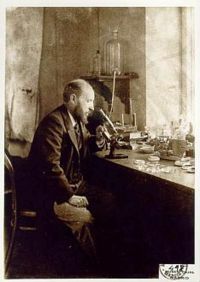 Ramón y Cajal in the lab. Since 1871, when German anatomist Josef von Gerlach had described the nervous system as a net of tangled cell branches, most neuroscientists had accepted the idea that nerve cells merged, forming a reticulum, or connected meshwork (Kandel et al. 2000). This theory, called the reticular theory, held that neurons' somata (later identified as the bulbous ends of individual neurons) mainly provided nourishment for the system (DeFelipe 1999). Even after the cell theory was postulated in the 1830s, most scientists did not believe that it applied to the brain or nerves. The initial prevalence of the reticular theory was due in part to an inadequate ability to visualize cells using microscopes, which were not developed enough to provide clear pictures of nerves. With the cell staining techniques of the day, a slice of neural tissue appeared under a microscope as a complex, tangled web whose individual cells were difficult to discern. Since neurons are involved in a large number of neural processes, an individual cell can be quite long and complex, and it can be difficult to find an individual cell when it is closely associated with many other cells. Thus, a major breakthrough occurred in the late 1800s when Ramón y Cajal used a technique developed by Golgi to visualize neurons. Golgi's method is a nervous tissue staining technique discovered in 1873 by Camillo Golgi, who found that by treating brain tissue with a silver chromate solution, a relatively small number of neurons in the brain were darkly stained. For reasons still largely unknown today, the solution is absorbed by only a few cells, but they transport it to all of their branches so that their microstructure is revealed in extraordinary detail. A human neocortical pyramidal neuron stained using the Golgi technique. Using Golgi's method, Ramón y Cajal reached a very different position from the reticular theory supported by most neuroscientists, including Golgi himself. He postulated that the nervous system is made up of billions of separate neurons and that these cells are polarized. Ramón y Cajal suggested that rather than forming a continuous web, neurons communicate with each other via specialized junctions called synapses, a term that was coined by Charles Scott Sherrington in 1897. Unbeknownst to Ramón y Cajal when he began his investigations, two scientists had already challenged the nerve net hypothesis: Wilhelm His (a scholar of neural development) and August Forel (a scholar of neural degeneration). Definitive evidence, however, could come only from clear pictures of distinctly bounded nerve endings. Ramón y Cajal, a skilled technician who modified Golgi’s techniques, provided that evidence with his studies of the bird retina and cerebellum in 1888-89. In 1891, Wilhelm Waldeyer, a German anatomist and supporter of Ramón y Cajal, coined the term neuron in a paper that outlined the neuron doctrine, and by the end of that year, most scientists had accepted that neurons were independent cells. Electron microscopy later showed that a plasma membrane completely enclosed each neuron, supporting Cajal's findings and weakening Golgi's reticular theory. For their technique and discovery respectively, Golgi and Ramón y Cajal shared the 1906 Nobel Prize in Physiology or Medicine. Ramón y Cajal's lifelong interest in painting and photography influenced his approach to scientific investigation. It was only when he began dissecting cadavers with his father (a physician and medical lab assistant) in 1868 that learning about anatomy became a visual experience, and Ramón y Cajal grew interested in science. In Advice for a Young Investigator (1897), Ramón y Cajal cites French naturalist and zoologist Georges Cuvier, who claimed that the scientist needed to understand his own artistic conventions and ways of representing the world before he could begin to compare the forms of animals (Otis 2001). Drawing of the neural circuitry of the rodent hippocampus in Histologie du Systeme Nerveux de l'Homme et des Vertebretes (Paris, 1911). Drawing of the cells of the chick cerebellum, from Estructura de los centros nerviosos de las aves (Madrid, 1905). Drawing of a section through the optic tectum of a sparrow, from Estructura de los centros nerviosos de las aves (Madrid, 1905). From Structure of the Mammalian Retina (Madrid, 1900). Drawing of Purkinje cells (A) and granule cells (B) from pigeon cerebellum (Madrid, 1899). Drawing of Cajal-Retzius cells (1891). Drawing of a Purkinje cell in the cerebellum cortex, clearly demonstrating the power of Golgi's staining method to reveal fine detail. In 1905, Ramón y Cajal published Vacation Stories, a collection of five science-fiction tales culled from an original manuscript of twelve stories. Though the stories were written in 1885-86, the period immediately preceding his scientific breakthrough, Ramón y Cajal refrained from publishing them for nearly 20 years, perhaps fearing that their anti-establishment attitudes might jeopardize his scientific funding. The five tales treat what were then cutting-edge scientific and technological topics, such as bacteriology, artificial insemination, photography, and hypnosis. Ramón y Cajal teases out the ethical and social implications of these developments in an ornate and ironic prose style. As the title suggests, Cajal's fiction allowed him to take a “vacation” from the conventions of scientific writing so that he could ponder the future of science (Otis 2007). Vacation Stories, was edited extensively in 1905, in part so that it would be associated with a literary movement called the Generation of 1898. A group of Spanish novelists, poets, essayists, and philosophers that included Azorín, Pío Baroja, and Miguel de Unamuno, the Generation of 1898 focused on the individual will as a means to regenerate Spain, perceived of as on a steady cultural decline since the mid-seventeenth century; its members also called for political and educational reform. An ardent patriot, Ramón y Cajal wrote articles for liberal journals and identified as a socialist. His patriotism, however, extended to an imperialist attitude; he saw science as they key to recovering Spain’s lost empire, believing that bacteriologists would attack the microbes that prevented Europeans from settling in Africa (Otis, 2001). Vacation Stories was not Ramón y Cajal's only foray into fiction: he had previously written two novels, but both manuscripts have been lost. Bentivoglio, M. 1998. Life and discoveries of Santiago Ramón y Cajal Nobelprize.org. Retrieved February 2, 2008. DeFelipe, J. 1999. Cajal. In R. A. Wilson and F. C. Keil, MIT Encyclopedia of the Cognitive Sciences. Cambridge, MA: MIT Press. ISBN 026273124X. Everdell, W.R. 1998. The First Moderns. Chicago, IL: University of Chicago Press. ISBN 0226224805. Kandel E. R., J. H. Schwartz, and T. M. Jessell. 2000. Principles of Neural Science, 4th ed. New York, NY: McGraw-Hill. ISBN 0838577016. Otis, L. 2007. Dr. Bacteria: The strange science fiction of Santiago Ramón y Cajal LabLit. Retrieved February 2, 2008. Otis, L. 2001. Introduction to Vacation Stories: Five Science Fiction Tales by Santiago Ramón y Cajal. Trans. L. Otis. Urbana and Chicago, IL: University of Illinois Press. ISBN 025207355X. Ramón y Cajal, S. 1999. Advice for a Young Investigator. Trans. N. Swanson and L.W. Swanson. Cambridge, MA: MIT Press. ISBN 0262681501. Ramón y Cajal, S. 1937. Recuerdos de mi Vida. Cambridge, MA: MIT Press. ISBN 8420622907. History of "Santiago Ramón y Cajal"
This page was last modified on 19 August 2015, at 16:32.